The corner of Echo Park Avenue and Sunset Boulevard is the center of Echo Park’s business district, and a Bank of America has stood at that prominent intersection for more than 75 years. That makes it the neighborhood’s oldest existing business and one of the oldest Bank of America branches to operate from the same location in Southern California. Bank of America’s presence in Echo Park extends back to March 5, 1926, when the Commercial National Trust and Savings Bank of Los Angeles, one of B of A’s many predecessors, opened a branch about one block west at 1706 Sunset Blvd. in what is Jensen’s Recreation Center. But on January 27, 1927, the branch had become part of another B of A predecessor, Liberty Bank of America, and its address had changed to its current location at 1572 Sunset Blvd, according to Bank of America historical records. 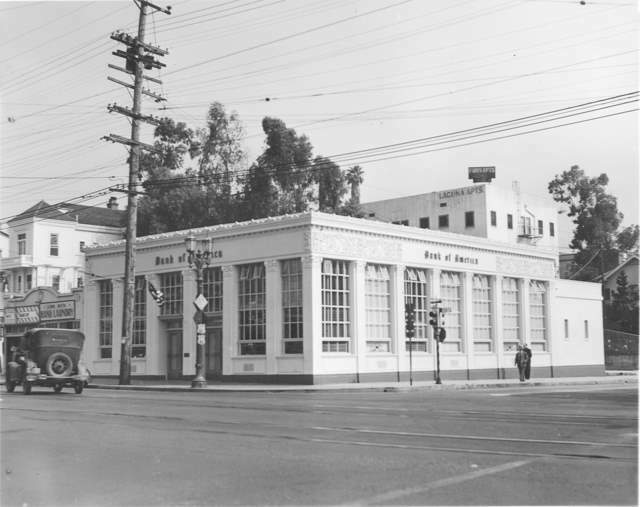 More than three years later, on November 3, 1930, the branch at the southeast corner of Echo Park and Sunset carried the Bank of America name. Despite the many name changes, all those banks were actually owned by Bank of America’s corporate parent, already a banking giant, called BancItaly Corp. and later TransAmerica Corp. of San Francisco. “Due to banking regulations and restrictions on branch banking at the time, the branch went through a series of name changes that reflected the bank’s strategy at the time to establish a single unified branch banking system under the title Bank of America NT & SA.,” said David Mendoza, manager of the Bank of America Historical Collection in San Francisco. While the bank building has been expanded, it has retained its basic features, including prominent glass windows separated by faux columns and decorative plaster work near the roof line. *Photo courtesy of Bank of America. Used with permission.